On the night of May 5, 1922, a crowd of some fifteen hundred men wearing white robes and masks gathered silently in a valley in the hills above Oakland, California. Rows of parked cars lined the nearby road, and two searchlights beamed across the sky as a fiery cross burned behind an altar draped with the American flag. At a given signal, five hundred more unmasked men marched four abreast toward the altar to take their oaths and be initiated into the order of the Knights of the Ku Klux Klan. Newspaper reporters were brought in to record the scene, and hooded Klansmen from as far away as San Francisco, Sacramento, Fresno, San Jose, and Los Angeles came to join their Oakland brethren for the ceremony. In the early 1920s, a powerful Ku Klux Klan movement burst forth in many American cities, targeting immigrant Jews and Catholics as well as people of color and attracting an estimated four to six million members, in what some consider to be the largest right-wing movement in our nation's history. By 1924, the Oakland Klan alone enrolled at least two thousand members, including such prominent and ordinary citizens as Protestant clergy, small businessmen, professionals and managers, salesmen, skilled workers, public employees, and even the son of a U.S. Congressman. A year later, the Oakland Tribune reported that eighty-five hundred Klansmen and women and their supporters from across the country filled the Oakland Auditorium to witness the swearing-in of five hundred members joining the national order. Blending prejudice with advocacy on issues like Prohibition and opposition to urban machine politics, the Klan enjoyed significant support in Oakland, a city whose population in 1920 was more than 90 percent white. Local Klan leaders won election as county sheriff in 1926 and city commissioner of streets in 1927, and quickly established their own patronage networks in city hall. Their power was finally broken in a celebrated graft trial prosecuted by Alameda County District Attorney (and later U.S. Supreme Court Chief Justice) Earl Warren. The scandal achieved such notoriety that it led directly to a major reform of the Oakland city charter in 1930 that abolished the city commissions and created a city-manager form of government. Fast-forward to 1946. By this time, Oakland had already experienced the economic and political upheavals of the Great Depression and New Deal eras, including the 1934 General Strike across the bay in nearby San Francisco. World War II accelerated the process of change, stimulating production in local shipyards and factories and attracting a massive influx of new workers to labor in the defense industries. By 1945, Oakland's population had increased by as much as a third and its black population had more than tripled, reaching almost 10 percent of the total number of city residents. Nationally, the end of the war was followed in 1946 by a wave of strikes, the largest in American history, involving more than four million workers. In Oakland, however, class polarization emerged not from the factories or the waterfront but from a strike of downtown retail clerks, most of whom were women. In late 1946, a majority of workers at Kahn's, a department store, and Hastings, a men's store, struck to demand recognition of their union. Local drivers from the International Brotherhood of Teamsters honored their picket line and refused to deliver goods to the stores during a busy holiday season. The retail business elites then pressured the city government to break the picket, and a massive display of police force sparked a citywide General Strike by the city's American Federation of Labor (AFL) unions in protest. For two and a half days, an estimated one hundred thousand striking workers from 142 unions shut down factories, shipyards, construction sites, most retail shops, and virtually all transportation in the city. Crowds estimated at between five thousand and twenty thousand people rallied in downtown Oakland in largely peaceful demonstrations outside the struck stores. Labor insurgency carried over through the following spring, when four union-endorsed candidates won upset elections to the city council, despite a vigorous Red-baiting campaign led by the Oakland Tribune. The popular challenge in city government lasted until 1950, when politics in Oakland again split into two camps. Backed by the AFL Central Labor Council, the local Congress of Industrial Organizations (CIO), and the National Association for the Advancement of Colored People (NAACP), the city council voted to authorize the construction of three thousand units of federally subsidized public housing, as part of a comprehensive plan to remove urban "blight" in the central city. Opponents attacked the plan as "socialistic" and, led by the Apartment House Owners Association and the Oakland Real Estate Board, launched a recall campaign against the progressive councillors. The result was the defeat of one of the councillors, the withdrawal of the housing proposal, and the end of the liberal coalition on the city council. Turn again to twenty years later. The city's African American population had grown steadily during the postwar decades, but racial segregation in housing kept it concentrated initially in the West Oakland ghetto, where unemployment and poverty were at least two to three times the city average. By the 1960s, however, continued population growth, along with displacements resulting from highway construction and urban renewal projects, pushed black residents toward other areas of the city. Tensions in racially transitional neighborhoods led to increased intervention by the city's social service and law enforcement agencies to control juvenile delinquency and manage problems of "social disorganization." These early efforts in Oakland later expanded under (and served as a model for) national urban social programs sponsored by the Ford Foundation and the federal government's War on Poverty. As the civil rights movement of the '60s spread from the southern states to cities in the North and West, such programs frequently became the catalysts for black community organization and political mobilization. In Oakland, struggles emerged for control of the city's Community Action Agency and Model Cities programs, centering on demands for jobs, housing, and social services, as well as long-standing grievances over police conduct in the black community. The latter, especially, helped give rise to the Black Panther Party for Self-Defense, founded in Oakland in 1966. Racial polarization persisted for years in Oakland, as a conservative white political elite held on to power in city government and black community organizations engaged in a "long march" through the corridors of an array of urban public bureaucracies. Unlike many other American cities, no major riot occurred in Oakland during the period, but the city did not escape violence, including several fatal shootouts between Black Panther members and police. Yet despite the imprisonment or exile of many leading members between 1967 and 1973, Black Panther Party chair Bobby Seale's 1973 campaign for mayor won a stunning 37 percent of the vote, in the largest turnout for a regular municipal election in Oakland's history. One city, three periods of popular insurgency. Each movement touched on above is radically different from the others; each one arises from a different social location or base, adopts a different form, and articulates a different collective identity, centered on ethnicity, class, and race, respectively. Yet all three occurred in the same place and within a relatively short span of about fifty years—in effect, one person's adult lifetime. How could that be? We are accustomed to thinking of cities as almost organic entities, each with its own unique biography and personality, the history of their physical development embodied in their streets, skylines, and neighborhoods, their collective memory held together by the accumulated ties of community. But what kind of community could repeatedly undergo such diverse moments of mass polarization? It is almost as if we were talking about three different cities. The sheer juxtaposition of these movements in one place challenges our understanding and raises at least two questions. First, what explains their rapid disjuncture? Even if we allow for substantial social change in Oakland between periods, that only begs the second question: What were the lasting effects, if any, of each movement on subsequent periods and on the local community? These questions are not just a puzzle for sociological theory, nor is Oakland an isolated case. Each one of these episodes occurred as part of nationwide social and political mobilizations that swept across twentieth-century urban America. In the 1920s, a resurgent white nativist (or Second) Klan prospered not only in the Old South but also in Indianapolis, Denver, Los Angeles, and other cities and towns across the northern and western United States. Contrary to popular perceptions, urban Klan members came from a wide range of socioeconomic strata; many had solid social standing, and the movement was strongest where native white Protestants were a majority or rising group, not a backward or declining one. Alongside racial and ethnic intolerance, Klan leaders frequently espoused mainstream middle-class values, calling for good government, better law enforcement, and improvements in public schools and city services, and they gained considerable support through participation in electoral politics. A few years later, urban workers were at the forefront of protests against the economic crisis of the 1930s. In 1934, strikes of factory hands in Toledo, truck drivers in Minneapolis, and stevedores in San Francisco sparked mass uprisings and bore witness to the revival of labor militancy throughout the country. In the mill towns of New England and in the auto and steel hubs of the industrial Midwest, CIO union drives galvanized virtually entire communities, while in the metropolitan port cities of the West and East, longshore, maritime, and transportation workers challenged local elites for power. With the end of World War II, the nation's streets filled with discharged soldiers, migrant war workers, and striking union members, and in 1946, citywide general strikes broke out not just in Oakland but also in Stamford, Connecticut; Lancaster and Pittsburgh, Pennsylvania; Houston, Texas; and Rochester, New York. Finally, African American experiences of migration and urbanization in the postwar period formed the social bases for the rise of the modern civil rights movement. Urban black communities provided the crucible, as sociologist Aldon Morris observes, for the "institutional building and the proliferation of dense social networks across localities and across neighborhoods in cities through which the movement was mobilized and sustained." Conditions in cities also transformed the movement as it spread from the South to the racial ghettoes of the North, charting a trajectory of protest from civil rights to black power. Across the era as a whole, these changes are remembered by their urban landmarks: Montgomery and Greensboro; Birmingham and Selma; Watts, Newark, and Detroit. "As an urban nation," political scientist John Mollenkopf writes, "urban development issues have been a primary, if not exclusive, factor in our national political development." Similarly, in this book I argue that each one of these movements both reflected and called into question the experience of urban political community at distinct moments in the past century. Each represented a crucial struggle over the boundaries of the polity and the meaning of popular civic participation, and all were pivotal historical junctures in the patterning of race, class, and urban politics in the United States. Each is significant in its own right, but my aim here is to bring all three together in one place, in order to examine their relationships with one another and the dynamics of mobilization and community in urban space. And by focusing on the puzzle of their discontinuity, I believe, an analysis of these movements can help shed light on the conditions of political community in our country today. If the theme of this study is discontinuity, what then do these diverse movements have in common? What theoretical guidelines or tools can we use to trace their causes and consequences, and to fit them into a comparative frame? How may we identify the key actors, the conditions affecting them, and the outcomes of their interaction? In this book, I employ an explanatory framework built on three basic analytic dimensions: socioeconomic structure, institutional politics, and urban civil society. To specify these I introduce here concepts drawn from three corresponding, well-known paradigms in sociology and political science: (1) traditional political sociology, grounded in the social bases of groups; (2) the "new institutionalism," with its central focus on the state; and (3) social movement theory, highlighting processes of group formation and mobilization in civil society. Each of these theoretical approaches helps explain part of the story, I argue, but each is by itself incomplete. Only by looking at it from all three perspectives together can we fully grasp the historical relationship between social movements and political community. Let us begin with the old school. Traditionally, the field of political sociology took as its starting point the social origins of politics, and specifically the emergence of groups and interests from positions in an underlying social structure. This was true of classical Marxism, with its antagonistic classes arising from the societal division of labor; but it was no less true for the American pluralist social science of the 1950s and '60s, in which groups of individuals from various social strata developed different political values and interests, expressed in voting preferences and other behavior. For both, macrostructural conditions in the economy and society produced the bases for the formation of groups, whose interests were translated more or less directly into the polity and into political outcomes. This approach has been subject to much criticism, of course, most often for its "reduction" of politics and culture to mere reflections of socioeconomic structure. Notwithstanding these criticisms, for our purposes the traditional paradigm continues to offer an essential point of departure. The analysis of social structure calls attention to categorical inequalities among groups, in terms of their access to and control over resources. Structures embody enduring, unequal, and contradictory relationships, and therefore generate recurring problems of integration and social order, the solutions to which raise questions of political power. Thus, a structure of wage labor creates problems for employers of recruiting, paying, and controlling a labor force, and problems for workers of securing jobs, income, and regulation of work. Structures of urban settlement create shared circumstances of collective consumption for residents of an area, as well as competition with other users of the spatial environment. In each case, the structural position of actors may systematically afford or deprive them of resources or advantages in pursuing different goals. Processes of structural change likewise affect the configuration of social relations found in the city. Geographers have examined the ways in which mobile capital investment and successive rounds of development produce uneven "layers" of urban economic and spatial structure. Others have studied the entry of generations of urban migrants and their descendants into various occupational or labor market niches. The distribution of residential housing also defines groups through the segregation of urban neighborhoods by class and race or ethnicity. These processes are all visibly illustrated in Oakland, where the peculiarities of the city's industrial and occupational structure, the means of access to its labor and housing markets, and its patterns of migration and urban growth produced the bases for spatial differentiation and social inequality among groups. A structural approach, therefore, identifies important societal cleavages and the unequal conditions affecting different groups. By itself, however, structural analysis does not explain each group's concrete political interests, their alignment with or against other groups, the strategic opportunities for action, or the particular shape of state institutions or policy. Nor does it explain processes of group formation and mobilization, or the outcomes of actual events of collective action. In short, socioeconomic structures are necessary but insufficient determinants of group formation and political conflict. Throughout the twentieth century, the city of Oakland underwent substantial structural change, much of it driven by external forces, as during the rapid transformation of the region during World War II. Nevertheless, local actors still had to negotiate the form and impact of these changes within the community. How they did so must be explained with reference to the other two analytic dimensions. More recent generations of political theorists have developed an alternative perspective, sometimes referred to as the new institutionalism. This paradigm shifts the burden of explanation from the structural bases of groups to the organizational field of politics, centered on the institutions of the state. In this view, state actors and political institutions do not simply reflect social forces but possess powers and interests of their own, and actively shape the political terrain for all groups. Unlike traditional political sociology, this theory holds that groups do not enter the political arena with predetermined capacities or goals. Rather, the political terrain itself determines the prevailing "rules of the game," deciding who counts as an actor, what is or can become an "issue," and how power is to be exercised. At the level of the city, this approach may be specified using the concept of urban political "regimes," as developed by political scientist Clarence Stone and others. In this model, local political actors build alliances with private economic and social groups in order to promote urban development and govern more effectively. Power is viewed as coordinating capacity within governing coalitions, rather than as direct command or control; constituent group interests are negotiated within the dominant coalition, which determines those policy alternatives that are deemed practically achievable and how groups may benefit from them. The alliances in the regime are held together by formal and informal ties extending into civil society, which facilitate the cooperation of actors around a unifying policy agenda and overall political project. The regime model links the formal institutions of the state with the composition of its constituent groups, their mode of cooperation, and the resources they can coordinate. Established regimes are self-reinforcing, with considerable power to suppress opposing interests, not so much through direct force as through the preemptive weight of the regime's accumulated relations of coordination. Subordinate or excluded groups face the daunting task of contesting not only more powerful actors but also the principles of organization in the regime. As Stone writes, "Challenging a regime is not simply a question of mobilizing opposition. It means restructuring the ways in which people and groups are related to one another and providing new avenues of cooperation between them." The periods of protest in Oakland each occurred under distinct urban political regimes. The Klan mobilized against a regime characterized by machine patronage, organized by ethnic politicians like Alameda County boss Michael Kelly. In the '30s and '40s, labor insurgency rose up against the power of what I call business managerialism, personified in the figure of J. R. Knowland, the conservative Republican publisher of the Oakland Tribune. In the '60s, the civil rights and black power movements encountered a racial order regulated by bureaucratic insulation, administered through the city government, quasi-independent local authorities, and federal programs. In each case, the organization of the regime embodied a specific set of political alliances and defined the dominant terrain of politics for the period. Institutionalist state and urban regime theories tell us much about the boundaries of inclusion and exclusion in the polity, the interests and alignments among political actors, and how groups become established or hegemonic in different political or governmental arenas. But they still do not explain the origins of insurgent movements, how oppositional identity develops within excluded groups, or how the latter sometimes do in fact challenge regimes. Neither structural change nor political institutions alone can explain mobilization, as it develops through a historical process of self-organization among groups, and as it is revealed in the episodic pattern of collective action observed in Oakland. To understand this process we must look to the third analytical dimension, the arena of civil society, using social movement theory as a guide. Current sociological theories of social movements generally incorporate elements of the structural and political-institutional perspectives described above, as causal factors shaping the context for mobilization. Thus macrosocial changes like urbanization, industrialization, and migration affect groups' mobilization potential through changes in population size and demographic patterns, relative societal location, spatial concentration, and means of communication. Similarly, the political terrain affects the strategic opportunities for action and the articulation of concrete issues and interests. Where social movement theory makes a distinctive contribution, however, is in its focus on processes of mobilization in civil society. By civil society I mean the "middle ground" of social relations between the socioeconomic structure and the state. This refers to the broad field of private, formal voluntary association—including the variety of social, cultural, and community organizations, churches, labor unions, neighborhood associations, advocacy groups, and others—as well as the more informal world of family and friends, personal networks of mutual dependency and support, and the spontaneous conviviality of the "daily round." Relations in civil society support the emergence of various public spaces in which people learn about, discuss, and form opinions on social and political concerns independently of the state and of the formal institutions of the public sphere (e.g., mass media, legislatures, courts). These social spaces correspond to what social movement theorists call "micromobilization contexts," and they function as arenas or sites for the collective formation of social identity and political opinion. Participants in these spaces engage in an open-ended "cultural and ideological contest or negotiation" that includes the content of public affairs, their identities as speakers, and the location of boundaries between the public and private worlds. As a whole, civil society is a "multi-organizational field" that encompasses diverse streams of public discourse, whose interactions create the possibility for innovative or oppositional cultures. In the urban environment, two crucial arenas where association and group formation occur are the workplace and the neighborhood. In the railroads and shipyards, machine shops and warehouses, canneries and department stores, and street corners and agency offices, groups of Oakland workers interacted with one another and developed traditions and habits of organization and collective identity. At the same time, uneven patterns of housing and urban development both united and divided groups, from the old ethnic working-class neighborhood in West Oakland, to the white middle-class housing tracts in the foothills of East Oakland, to the growing division by race throughout the city after World War II. These spatial settings formed the scene for the routines of everyday life and the experience of urban community. Social movements are constituted in and through this medium of civil society, through the collective working out of constructions of identity, solidarity, and public awareness. But civil society does not automatically produce political insurgency. Subordinate groups may be internally stratified, fractured by structural contradictions, or divided by legacies of prior organization and political conflict. Public spheres are often fragmented or dominated by elite interests, while civil society itself harbors exclusionary and hierarchical relations of private power. The ambivalence of civil society underlines the importance of specialized social movement organizations as strategic agents, who intervene in civil society to make groups into collective actors. Movement organizations do this by employing select repertoires of associational forms, resources, and tactics, including the cultural symbols deployed to inspire and maintain group solidarity. Resources are concentrated through an often difficult process of organization building, alliance formation, and outreach among the indigenous networks and relationships of persons within subordinate populations. At the same time, movement organizers try to unify the group through discursive strategies of "framing"—articulating a sense of collective identity and shared grievance—that draws on the group's own culture and the discursive possibilities in the public sphere. Movement organizations act as intermediaries between the mobilization of identity in society and the negotiation of interests in the polity. To paraphrase sociologist C. Wright Mills, they turn private troubles into public issues, transforming common experiences of group inequality into cohesive oppositional identities and specific goals, alliances, and political demands. My analysis of Oakland focuses especially on the role played by social movement organizations against the backdrop of group formation in civil society. So, for example, the Klan used the familiar model of the secret fraternal society to promote a nativist ideology that combined Protestant moralism, urban reformism, and racial and ethnic chauvinism into a persuasive collective identity and mobilizing force. Labor unions gave an organizational form and voice to workers who had endured the Depression, migration, and war, transforming their hopes and fears into mass militancy and political action. The civil rights and black power movements drew on forms of ghetto neighborhood organization and racial solidarity to unite African American residents and challenge the city to overcome racial segregation and inequality. This brings us to the question of urban political community. As we have seen, structural forces concentrate diverse populations in urban space, creating interdependencies of work, consumption, and residence in a local economic area, as well as shared interactions with local government and political institutions. Beyond these linkages, such populations form a political community through their formal and informal recognition of mutual rights and responsibilities to participate in collective self-governance. The content of their community, however—its meaning and boundaries—remains historically variable and often politically contested. Who belongs to the community and how they recognize their rights and responsibilities to one another are critical questions not only for analysis but for the participants themselves. For us, the answers to these questions will be most clearly revealed in events of collective action. The analytic dimensions of socioeconomic structure, institutional politics, and civil society provide the theoretical scaffolding for my narrative account of events in Oakland. Within this framework, a comparison of the three movements reveals not an invariant outcome but a recurring problem. Urban political elites govern through the construction of regimes, organizing selective ties among actors in the state and society through machine patronage, business management, or bureaucratic administration. These regimes define the boundaries of community and the terrain of political power, in the cases described here along the lines of ethnicity, class, and race. Structural changes can and do destabilize regimes, however, creating opportunities for excluded groups. Challenging actors mobilize on the field of civil society, building up group solidarity, articulating their collective identity, and reaching out to a larger public. In the course of insurgency, challengers bring to bear strong new claims of political community on actors in the urban setting, in order to win recognition and achieve their demands. In so doing, movement actors must create or expand the public spaces needed to make their challenges heard. Yet these public spaces are highly fragile, political institutions are normally exclusive, and privileged groups turn away from public dialogue toward the protection of private interests and domains. Under normal conditions, regime hegemony rests not on any strong consensus but on the demobilization or dispersal of opposition—hence the explosiveness of polarization when it occurs. And urban civil society in the United States is itself a deeply fragmented terrain, divided historically by race, class, and other social fissures. The fragmentation of urban civil society undermines the capacity of the local civic arena to bind actors together in a mutually responsive political community. Social movement organizers maneuvering on this terrain face difficult tasks: maintaining group unity, keeping coalitions together, and contending with more powerful actors. Moments of collective action are inevitably uncertain and involve real risks of repression, disintegration, or defeat. In the absence of a strong civic community, movement organizers turn instead to institutional strategies, attempting to secure their gains by incorporating group demands into the political fabric of the regime. The turn to institutionalization leads on the one hand to the decline of mobilization, and on the other to the redrawing of the boundaries of institutional power. Subsequent challenges, then, emerge from groups with different identities affected by different dimensions of exclusion, who face the legacy, and the limits, of previous rounds of reform. Thus discontinuity. 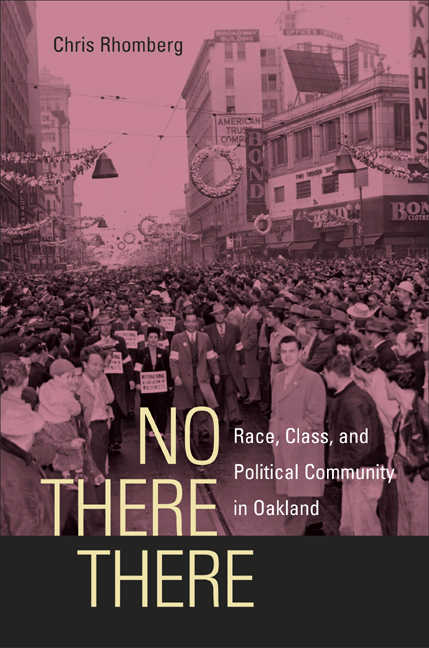 Again and again—through protests and strikes, and in key local elections—challenging actors in Oakland sought to enlarge the sphere of public discourse, and to gain access and entry to the polity. Yet, as often, the strength of the political community was insufficient to sustain the actors' engagement with one another. There was not enough there there; civil society remained divided, coalitions broke apart, and participation declined as movement actors settled into institutional reform. The outcomes produced the demobilization of collective actors and the reconstitution of urban regimes, not a continuing dialogue among groups in a dynamic political community. Discontinuity, however, also means that boundaries and identities are not fixed. The institutional settlements affected the formation of actors but failed to eliminate the structures of inequality. As new structural changes occurred, or as relations among groups broke down, so the conditions of political community were again transformed. Social movements remained crucial vehicles in this process, reconfiguring identities and mobilizing collective actors in new forms. In a nutshell, this model describes the relationship I observe in Oakland between social movements and urban political community. How does my analysis compare to other accounts of these dynamics? To be sure, more traditional interpretations take a different view. Among the latter are what might be called the assimilationist, cyclical disorder, and social capital models of political community. Each of these draws from and lends itself to broad historical readings of American politics and society, and each offers a different explanation for social movement discontinuity. Yet none adequately distinguishes the three dimensions of socioeconomic structure, institutional politics, and civil society. Perhaps the most familiar version is the traditional assimilationist paradigm, in which periods of mobilization merely reflect the temporary pressures associated with the accommodation or entry of new groups into the American polity. In this model, cities are the great melting pots of American democracy, where members of incoming groups find opportunities for education and social mobility; develop multiple, cross-cutting social ties; and learn to participate in a unifying, public-regarding "civic culture." Movements are but symptoms of the individual and social adjustments that occur in this process, which results in the progressive incorporation of groups into an open, liberal, and pluralist institutional arena. In this view, the Klan serves as a negative case: Traditional accounts portray it as a reactionary extremist movement, the "last desperate protest of a nineteenth-century Protestantism in the course of eclipse." Attracting mainly isolated, downwardly mobile or lower-middle-class persons on the margins of urban society, the Klan's bigotry and intolerance offered symbolic relief for its supporters' status anxieties, but the organization ultimately collapsed, along with its disappearing social base. By contrast, the labor struggles of the '30s and '40s captured the democratic aspirations of the rising urban immigrant working classes and delivered them into the high tide of political incorporation under the New Deal. Under the auspices of the 1935 National Labor Relations Act, unions became partners in the formation of an industrial welfare state, gaining a permanent status as an interest group aligned with the Democratic Party. What the labor movement did for ethnic working classes, by analogy, the civil rights movement did for blacks. As African Americans migrated from the rural South to the urban centers, they followed in the footsteps of the European immigrants, first organizing in their own communities and eventually pressing for the recognition of their rights. The civil rights movement won by appealing to established democratic values, earning northern liberal support against the archaic racial caste system of the Old South. With the passage of federal civil and voting rights laws in the 1960s, African Americans finally secured entry as equal members of the polity, fulfilling the promise of American democracy. The assimilationist tradition rightly puts social movements in the context of macrostructural processes and periods of institutional change. But the ideology of progressive liberal incorporation often fails to understand how structural forces affect the social bases of groups, both before and after the process of "entry." A growing body of historical research now shows that urban Klansmen were not disproportionally lower-class or marginal individuals, but instead roughly paralleled the general population in their communities. The organization of labor unions often both reflected and reinforced exclusionary labor markets and racial-ethnic divisions within the urban working class. And behind the achievements of the civil rights movement were persistent patterns of socioeconomic stratification, between blacks and whites and within the black population, some of which have since become even more pronounced. Just as important, the concept of an integrative civic culture presupposes that interests are represented more or less equally or transparently within a liberal political sphere. But civic and political institutions can be highly selective about which interests gain access and how they are represented. In the '20s, the Klan's racial and ethnic prejudice often proved no barrier to its political legitimacy, but rather mirrored prevailing public opinion among white Protestant middle classes, merging rhetorically with other elements of so-called progressive municipal reform. Conversely, labor historians have observed the institutional constraints imposed by the legal regulation of collective bargaining, notwithstanding the real gains that workers achieved. Capital mobility and limitations on workers' rights to organize meant that firms could abandon older unionized industrial cities and states for nonunion areas in the suburbs and in the South and West, where rapid postwar growth sustained the regional bases for the alliance of conservative Republicans and southern Democrats in the U.S. Congress. Throughout the postwar era, the unions were unable to alter these substantive constraints, despite their allegiance to the majority Democratic Party. Other scholars have emphasized the racial boundaries that characterized New Deal politics and policies from their beginnings. Later, as black migration increased to the urban North and West, federal and local housing and urban renewal programs systematically segregated or discriminated against African Americans. These and other government actions served to perpetuate informal but entrenched societal relations of racial exclusion in housing, employment, and education. Nondiscrimination laws alone proved insufficient to undo these relations, leading to the introduction of affirmative action and other mechanisms of state intervention to achieve integration and racial equality. These policies have had mixed success, however, and are themselves now increasingly under attack. In short, the simple ebb and flow of mobilization cannot be taken as a sign of stable liberal assimilation. The fate of the New Deal and civil rights coalitions underlines the impermanence of their political settlements; contrary to the image of steady, progressive inclusion, relations among groups have seen periods of democratic expansion and conservative retrenchment. In the city, actors are made, unmade, and remade, altering not only the balance of power among interests but also the culture of the civic community. A second, more skeptical, view of discontinuity might be labeled cyclical disorder theory. In this model, democratic institutions are if anything too open and subject to popular pressures. For political scientist Samuel Huntington, American political culture is defined by a historically constant system of beliefs or "creed," identified with values of liberty, equality, individualism, and democracy. Periodically, Americans are seized by an intense moral fervor for these ideals, yet such moments of "creedal passion" raise excessive and contradictory demands that no government can practically satisfy. The result is an inevitable cycle of disappointment, cynicism, and political retreat, which then prepares the ground for renewed outbursts of creedal intensity. Political scientist James Morone argues that reformers in American politics win support by invoking a myth of "the people" as a united community, participating directly in the control of their own affairs. Once the desired reforms are actually implemented, however, the image of community dissolves into a maze of fragmented government bureaucracies and competing, self-interested groups. In these theories, democratic participation leads not to assimilation but to conflict and political gridlock, while collective action ends mainly in unintended consequences. Radical protest undermines established authority without realizing the reformers' ideals, and other critics have blamed social movements, particularly those of the '60s, for contributing to the breakdown of civic solidarity and urban moral order. Cyclical disorder theorists correctly point to the limits of assimilation, and of the political system's capacity to mediate contradictory demands. But they do not adequately explain how or why political institutions have the distinct capacities that they do. In Oakland, as we shall see, the machine politics of the '20s, the business managerialism of the '30s and '40s, and the large-scale bureaucratic administration of the '60s were all different ways of organizing the polity, and each generated different kinds of responses. By contrast, the idea of a constant, invariant cycle does not capture the historical stakes involved in each period, and obscures significant differences in the development of political institutions and their relation to groups in society. Similarly, broad, abstract notions of "creed" or "people" do not account well for the complex ways in which ethnic, class, and racial identities operated at each juncture. After all, the Klan was hardly egalitarian, unions did not preach individualism, and the civil rights movement showed no liberal fear of government. Likewise, pessimism about protest does not allow for how mobilization might actually express collective agency or effectively bring about change, notwithstanding its varied consequences. In each period, movement actors articulated specific identities, grievances, and alternative visions of the urban future. We will do better to trace more closely who the actors were in each case, their paths of formation, and their roles in the struggle to define their political community. Over the past decade, scholarly and public debates in the United States have again turned to problems of community and politics, although this time for very different reasons. Unlike the earlier periods of mobilization, in the 1990s researchers were more likely to note a disturbing decline in popular civic and political participation. In contrast to both the assimilationist faith in liberal integration and the cyclical theorists' distrust of democracy, Americans seemed to be losing their sense of political community altogether. One of the more prominent figures in this "civic disengagement" debate has been political scientist Robert Putnam. In a series of publications, Putnam has argued that Americans have experienced a historic loss of individuals' "social capital," by which he means those "features of social life—networks, norms, and trust—that enable participants to act together more effectively to pursue shared objectives." For Putnam, social capital is the key to a healthy civil society, the essential precondition for bringing citizen action together with public policy and "making democracy work." The collapse of a broad social connectedness has deprived citizens of vital links with their communities, thereby diminishing their attachment to public concerns. What has caused this decline of community? The demands of modern organizations of work, the sprawling pattern of urban growth, and the effects of television and mass media on leisure time have all played a part in eroding the ties among individuals. But for Putnam the most important factor is a generational gap in the socialization of persons into the norms and networks of social trust. In order to revive democratic participation, Putnam advocates revitalizing local grassroots forms of voluntary association, as a way to increase social capital and as a forum for popular civic education. The debate over civic engagement has raised important questions about the current state of American political community, yet the analysis of social capital shares some of the weaknesses of the earlier theoretical approaches. The benign vision of local civil society discounts the historical weight of both structural group conflict and institutional power. Putnam's model implicitly recalls the older sociological theory of social disorganization, in which individuals' atomization leads to anomic dysfunctions and the failure to integrate into a consensual civic culture. Correspondingly, his programmatic stress falls on the education and socialization of individuals, not on the structural forces that unequally distribute resources and actively produce disorganization, or on the institutional barriers that discourage participation and disempower certain groups. Indeed, under some circumstances, comparatively higher levels of civic engagement might well take the form of polarization and mass protest, as we will see in Oakland. The metaphor of social capital makes community a marketlike commodity, but the logic of markets does not spontaneously create democratic institutions. Putnam is right to bring our attention to the lived experience of everyday life in neighborhoods, workplaces, and other "face-to-face" associational settings typical of urban civil society. But the social capital approach blurs the transition from private voluntarism to political action, from civil society to public politics. The focus on individuals' norms and behavior neglects the role of collective actors in sustaining participation and in forging the bonds of political community. People engage in the life of their communities not only through private affiliations but also as members of mobilized groups, through strikes, demonstrations, elections, and other forms of collective action in the public sphere. These are often concentrated in highly contentious and pivotal events, whose outcomes shape our understanding of the content of political community. The assimilationist, cyclical disorder, and social capital theories all fail to account adequately for the problem of social movement discontinuity. All underestimate the effect of structural forces on the social bases of groups, and on the resources available to them. All presume an open, neutral, and liberal civic and political arena, without adequately theorizing the institutional capacities, organization, or biases of the state. Finally, none provides an appropriate framework for understanding social movements, or political community, as a relationship among collective actors. This book offers a case study of these three social movements in Oakland, from the point of view of urban political development in twentieth-century America. As a case study, it draws on that tradition of social research, associated with Max Weber, which is grounded in the causal explanation of social action in specific historical contexts. In this tradition, as Charles Ragin writes, sociological analysis aims at generating "limited historical generalizations that are objectively possible and cognizant of enabling conditions and limiting means—of context." The approach is case-oriented because it looks to the configuration of causes and conditions in a given historical setting, interpreted as a whole. The in-depth study of particular cases can allow us to uncover those social mechanisms—or what Charles Tilly calls "recurrent causal sequences of general scope"—that are analogous across cases or relevant in other settings. My focus is on the struggles of groups and actors to forge a political solidarity and community in an urban context. As a window onto these processes, the city of Oakland has certain advantages. Founded in the middle of the nineteenth century, it grew rapidly to its mature size during the period of this research, in the early and mid twentieth century. A medium-size city, with a population of 384,575 in 1950, it is large enough to feature problems of concentration, industrialization, and population change typical of American urban centers, yet small enough to permit observation of its social and political relations more or less as a whole. Moreover, the prominence of all three movements in the city's history makes it an especially useful case, displaying the more pronounced aspects of polarization and discontinuity that are my specific concerns. At the same time, no claim is made here that Oakland is representative, statistically or otherwise, of all American cities. By identifying its unique circumstances, however, we can establish comparative standards for analyzing similar and different conditions in other cities and regions in the United States. Nor do I assume that all relevant contextual factors are enclosed within the city itself: Larger economic forces, state and national politics, broader cultural traditions, and even global events like World War II all exerted enormous influence. But whatever these external forces were, local actors still had to negotiate their impact on group relations and politics within Oakland, and they often did so in highly conscious and deliberate ways. That is the process that I will examine here. Because of my interest in mobilization, I divide the overall time frame in Oakland into three periods, each associated with a specific movement and its dominant political terrain: roughly 1900 to 1930, 1930 to 1950, and 1950 to 1977. Although these periods do not perfectly separate each movement in time, arranging Oakland history in this way serves my analytical purposes in two ways: First, it allows for an individualizing comparison between periods, calling attention to their distinctive characteristics and differences; and second, it provides a longitudinal comparative design for inquiry into the sequential relationship between periods of movement activity. My central problem is to explain change—discontinuity—across periods in the same place, and correlatively to ask what effects earlier periods had on later ones. Hence, I depart from the traditional variable-based causal models that are standard in much of contemporary social science. Such models require strong assumptions of equivalence and independence between cases in order to test the validity of uniform hypotheses generalized for all cases. This would require assuming, at the outset, that each period had no effect on the others—in other words, that at three successive times, Oakland really was simply three different cities, all subject to the same causal forces. Regardless of whether such a claim were plausible, it would immediately assume away an investigation into what I am really interested in—namely, the discontinuity and sequence, or change, between periods. Moreover, in variable-based methods, cases do not operate as contexts, or configurations of parts in interrelated wholes, that are subject to reflexive action or internal transformation. Instead, cases are assumed to be drawn from a population of fixed entities with analytically separate attributes. The researcher hypothesizes that some of these attributes affect other attributes, and the hypothesized causal factors act largely independently from one another to produce constant effects across all cases. Again, this abstracts from the very features with which I am most concerned: the relations between groups and actors in the temporal unfolding of events. Therefore, I adopt a narrative analytic method, in order to capture what sociologist Larry Griffin describes as "the mutually constitutive interplay of agency and social structure, a dynamic continuously occurring in time and through time." From this perspective, causal social forces are embedded in the sequences of interactions between actors and their historical context, understood as a set of enabling conditions, influences, and constraints. This approach allows for the possibility that actors and events may alter their environments, that outcomes in earlier periods may affect conditions for later ones, and that the institutional settings for and meanings of action can change, for example, as the central axis of political conflict shifts from one set of identities to another (see the methodological appendix). In the story that follows, I begin my study of each period by surveying the socioeconomic structural conditions generating the social bases of unequal groups. I then describe the organization of the dominant political regime, its member groups and their mode of coordination, and the ways these factors define the boundaries of inclusion and exclusion in the urban polity. I observe the paths of group formation on the field of urban civil society, focusing especially on the rise of new or newly mobilized collective identities and forms of organization. At crucial junctures, the paths of these groups intersect in urban public space. I follow the interactions of movement actors and established elites in sequences of mobilization and conflict, tracing the steps that lead to polarization and political crisis. In such moments, the opposition between the goals of the movement and the mechanisms of reproduction in the regime highlight the choices at stake and their implications for the future pattern of urban development. The outcomes of these events, in turn, shape the political terrain for subsequent periods of regime-making and social movement challenge. For clarity of exposition, each period is divided into two chapters. The first describes the context of mobilization under the existing regime, and the second concentrates on events leading to increasing polarization and its outcomes. Chapter 2 begins by drawing a baseline of economic, political, and social development in Oakland from the beginning of the twentieth century to 1920, showing how these forces generated the principal contending groups and the dominant political terrain. On the one hand, an old corporate elite and an ethnic (Catholic) working class were united through a system of urban machine patronage, while on the other, a rising downtown merchant class and white Protestant middle class experienced exclusion from this regime and increasingly mobilized for reform. Structural changes up through World War I destabilized these actors and their alliances, leading to a brief upsurge of working-class militancy, which was largely defeated after the war. This review sets the stage for the events of the '20s, described in chapter 3. Rapid commercial and residential growth greatly increased the size and strength of both downtown business and the white middle class, the latter providing the social base for the emergence of the Ku Klux Klan. Taking the form of a secret fraternal society (a common form of grassroots social and political organization at the time), the Klan mobilized opposition to the machine using a discourse of ethnic nativism. Once in power, however, the Klan leaders themselves succumbed to the institutions of machine politics, becoming simply one more corrupt faction. Middle-class whites then transferred their allegiance from the Klan to the downtown business leaders, who pushed through a series of reforms that effectively eliminated machine politics from city government. These reforms produced a major break and reorientation in the relations between the local government and societal actors. Oakland shifted from a political terrain dominated by ethnicity to one more strongly defined by class power. Chapter 4 begins with the consolidation of a new regime, which I describe here as business managerialism. Led by Oakland Tribune publisher Joseph Knowland, the downtown elite intervened more or less directly in the control of Oakland's economic development, while the reformed city council maintained a middle-class "caretaker" government oriented toward low taxes and homeowner services. At the same time, the crisis of the Great Depression stimulated a return of working-class militancy, marked by the rise of unions affiliated with the CIO. During the '30s, however, organizational rivalry between the CIO and the older, larger AFL unions kept the working-class challenge in check, helping to preserve the power of the urban regime. In the '40s, wartime industrialization brought a massive new influx of working-class population, socially isolating the business regime and creating the conditions for class polarization. In chapter 5, I analyze the events leading up to and during the General Strike, and the political mobilization that followed. In the General Strike, Oakland workers demonstrated an extraordinary class solidarity, allowing the unions to defend themselves successfully in a showdown with the downtown elite. The pursuit of democratic reform in city government, however, called for more complex alliances on a difficult terrain, and the unions' inability to bridge divisions of class and race, even within their own ranks, limited their ability to achieve broader institutional change. Chapter 6 picks up the third case. By the early '50s, the downtown elites had weathered the postwar working-class challenge, and they began to pursue their own agenda of urban and regional redevelopment. This included major changes in housing, economic, and transportation infrastructures, administered by an array of new bureaucratic public authorities. Redevelopment led to the displacement of the growing yet politically excluded black population and to the dissatisfaction of white homeowners who opposed the movement of black residents into their neighborhoods. Political elites responded by adding separate layers of administrative social programs, largely funded by the federal government and premised on the principle of bureaucratic insulation. While offering opportunities, these programs also channeled black mobilization toward a parallel form of bureaucratic enfranchisement and reinforced the compartmentalization of black demands. The failures of this form of incorporation helped drive the racial polarization of the late '60s, discussed in chapter 7. In particular, controversies surrounding the issues of unemployment and relations between police and the community formed the local context for the emergence of the black power movement. This took shape in several forms: in the rise of the Black Panther Party among black youth, in the radicalization of protest in the city's federal Community Action and Model Cities programs, and in the turn to demands for community control. Official resistance on the part of the city government to these pressures maintained the atmosphere of racial polarization in Oakland, setting the stage for the electoral campaigns of Bobby Seale for mayor and Elaine Brown for city councillor in 1973. The final chapter recaps the dynamics that lead to social movement discontinuity, focusing on the problem of urban political community, and explores some of the theoretical implications of the results. I compare the experiences in Oakland with those in other American cities and reflect on the significance of the analysis for current debates on civic and political participation in the United States. Throughout the book, my concerns will be to understand not only the way things are, but how they can change. Challenged by Ku Klux Klan action in the '20s, labor protests culminating in a general strike in the '40s, and the rise of the civil rights and black power struggles of the '60s, Oakland, California, seems to encapsulate in one city the broad and varied sweep of urban social movements in twentieth-century America. Taking Oakland as a case study of urban politics and society in the United States, Chris Rhomberg examines the city's successive episodes of popular insurgency for what they can tell us about critical discontinuities in the American experience of urban political community. Chris Rhomberg is Associate Professor of Sociology at Yale University.